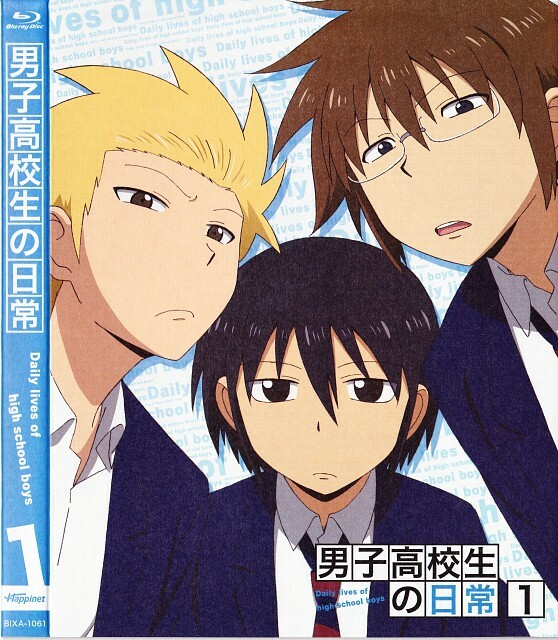 "Daily Lives" is a series of skits following the lives of Tadakuni, Yoshitake, and Hidenori, three high schoolers who wile away their days making up crazy scenarios to escape the boredom of ordinary life. From becoming heroes and saving the world from invading giant mecha, to figuring out how to get a girlfriend, the boys put an unique and energetic spin on everything they do...which often gets them in trouble when others are involved. DKN is a collection of shorts about, well, high school boys (and girls!) and what they do, with slice-of-life anime tropes employed and lampshaded left and right. The humor is hit or miss; you'll find some stories more funny than others, and some I felt were only included to fulfill the running time requirement. The characters do stupid stuff all the time and it's refreshing to watch them just BE KIDS and using their imagination, as opposed to a lot of anime which pile on the drama and grittiness. The art is decent, and some characters have surprisingly deep voices! There's not a lot of continuity, so it's a good anime to watch if you don't want to think too hard about plot or stuff like that. Funny and silly, some of the plot and the character designs reminds me of Kimi to Boku. When Tadakuni got caught wearing his sister's clothes I was laughing so hard. The boy meets girl ending in the first episode with Yoshitake was funny.^^ Even sadder/funnier that the girl actually went out trying to find a boy to set up the situation she wanted to experience; even worse unknowingly he played right into it. Seeing all the silly/stupid things the boys get into is halarious. There's also a group of three girls from East High who also do a lot of the same things as the boys. That makes the series even funnier because you can see things play out from both sides and not just the boys. You can certainly tell the director from Gintama is also working on this because the humor is very similar. some episodes aren't funny, but some are and are very funny in fact. silly things that high school boys (and girls) do which are honestly VERY true indeed. i can relate to. artworks standard and ordinary but guess the juciy bits are the story itself. seiyuu performance - hmm... Tadakuni voiced by Irino-san just doesnt sound like the lead. Noticeable effort from the Literature Girl voiced by Hikasa-san who is very skillfully performed and sounded just right for the character. No feedback on Daily Lives of High School Boys.